A mysterious letter has come to light purportedly from one of three inmates who famously escaped Alcatraz in 1962. Someone claiming to be John Anglin wrote to San Francisco police in 2013, but it has only now been made public. "My name is John Anglin," reads the letter. "I escape from Alcatraz in June 1962. Yes we all made it that night, but barely!" To this day, the three escapees remain on the most wanted list with photos of what they might look like today. It claims brothers John and Clarence Anglin along with inmate Frank Morris lived into old age after escaping the prison half a century ago. The author says Clarence Anglin died in 2008 and that Morris died in 2005. The writer tries to make a deal with authorities, saying: "If you announce on TV that I will be promised to just go to jail for no more than a year and get medical attention I will write back to let you know exactly where I am. "I am 83 years old and in bad shape. I have cancer." According to the letter, John Anglin lived in Seattle for most of his life and spent eight years in North Dakota. At the time the letter was sent he was reportedly living in southern California. San Francisco police did not make the letter public despite obtaining it five years ago, according to CBS. It was given to San Francisco television station KPIX from an unnamed source. The US Marshals Service, which has been responsible for the case since 1978, submitted the letter to the FBI laboratory for forensic handwriting analysis. "Handwriting samples of all three escapees, John Anglin, Clarence Anglin and Frank Morris, were compared to the anonymous letter, and the results were deemed 'inconclusive,'" said a statement from the US Marshals Service. The nephew of John and Clarence Anglin told CBS that his grandmother used to receive roses with John and Clarence's signature on the cards several years after the escape. "I really haven't come to a conclusion whether I believe that it's John reaching out or not," nephew David Widner said. Mr Widner expressed dismay that the letter was not delivered in a timely manner to the family. "For him to say he had cancer and was dying, I feel like they should have at least reached out to the family and let them know it existed," he said. 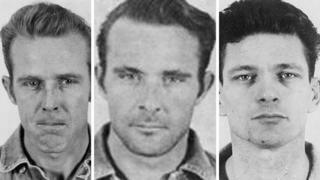 Behind bars for robbing a bank, the three prisoners proved that Alcatraz -a federal penitentiary reserved for the "worst of the worst" - was not as "escape proof" as once believed. It is believed the three inmates spent months digging a tunnel out of their cells using sharpened spoons. The men made an inflatable raft out of raincoats, set off into the water sometime at night, and were never seen again. The former prison is now a popular San Francisco tourist site, with more than a million tourists each year. John Anglin's cell, where he escaped through a vent in the wall, is one of the main attractions on the tour. The prison, built on a rocky outcrop in the middle of the bay, was shut down in 1963, a year after the men's escape. Authorities said at the time there was no way the trio could have swum across the frigid waters of the San Francisco bay, although the span is today tackled by triathletes. The breakout was immortalised in the 1979 movie Escape from Alcatraz, starring Clint Eastwood.